Originally from Finland, Parisienne by marriage. Happy mother of a happy daughter. I have traveled in more than sixty countries for pleasure and work. Love cooking, restaurants and food markets. Design and architecture catch my eye. This blog is about everyday life in Paris, past memories converted into travel stories and new adventures. Since our trip to Tamil Nadu we have been regulars at Saravanaa Bhavan, which is a South Indian restaurant. It started in Chennai, Tamil Nadu, and has gained a lot of success all over the world in recent years. You can find Saravanaa Bhavan in Dubai, New York, etc. Everything at Saravanaa Bhavana is vegetarian so don’t expect the usual palak paneer, cheese nan and butter chicken. If you have never been to South India, you will probably find dishes that taste like nothing else you have ever eaten before. And this is what I love about Saravanaa Bhavan: the taste is sublime, sophisticated and curious!!!!!! And good for your health. 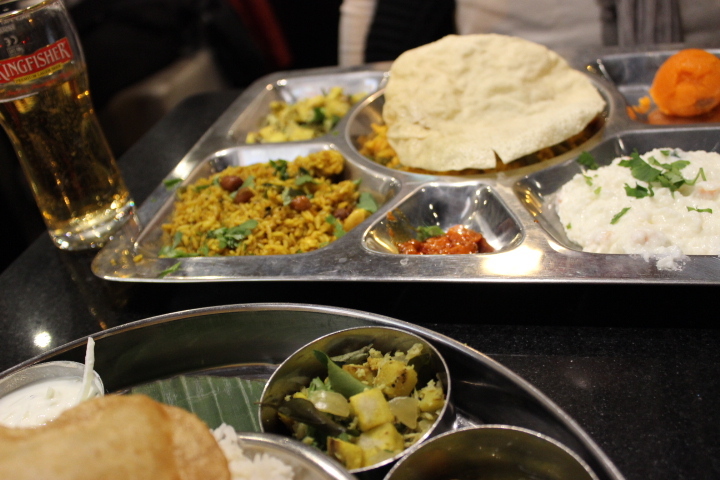 Last night we had our usual: South Indian meal (thali), onion rava masala dosa and business meal. This is a bit too much for two, but since we love all of these three dishes, we can never decide! South Indian meal looks like this: and consists of: chappathi with side dish, rice, sambar, rasam, special kuzhambu, vegetable curries, raitha, curd, appalam, pickle and something sweet. 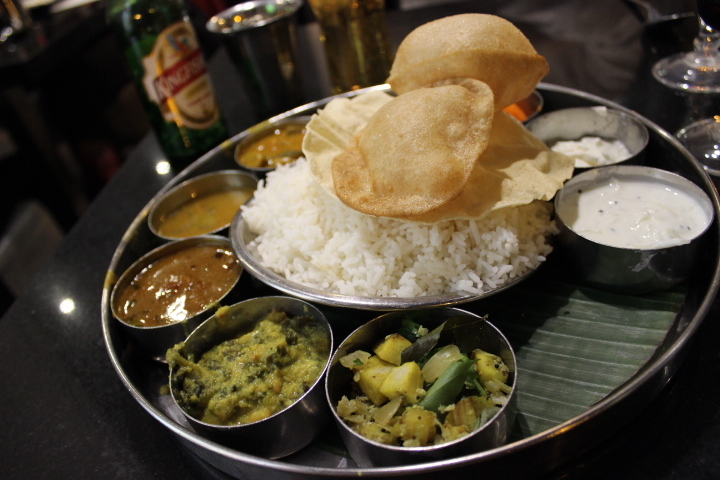 What is nice about this thali is that you can order more of any side dish and rice for free. 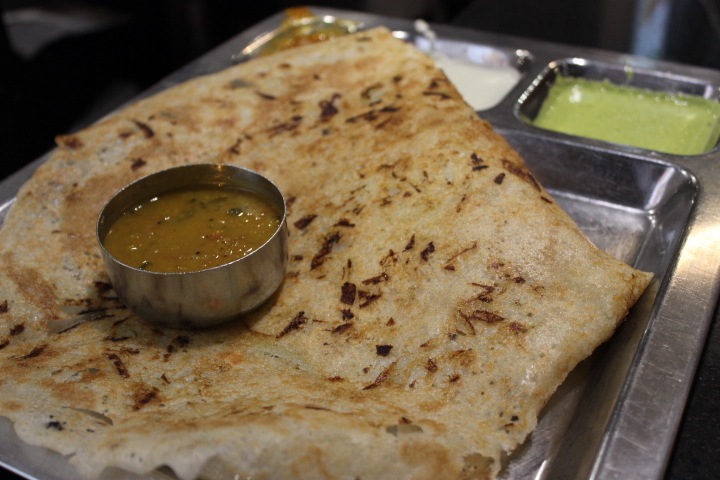 Onion rava masala dosa looks like: and it is a crispy wheat and rice flour crepe stuffed with mildly-spiced mashed potatoes and onions. Business meal looks like this: and it includes sambar rice, curd rice, special rice of the day, poriyal, appalam, pickle and something sweet. I feel eternal love toward all of these dishes and cannot have enough them! PS Saravanaa Bhavan increased their prices this summer, but it is still very affordable. South Indian meal costs 13€, business meal 10€ and a dosa 7€50. Our only disappointment is that they don’t serve Indian wine any more –only Bordeaux. As we told the waiter yesterday, Grover is an excellent Indian red wine! This entry was posted in Uncategorized and tagged food, India, Paris, restaurant, South India, wine on October 31, 2013 by Miia. 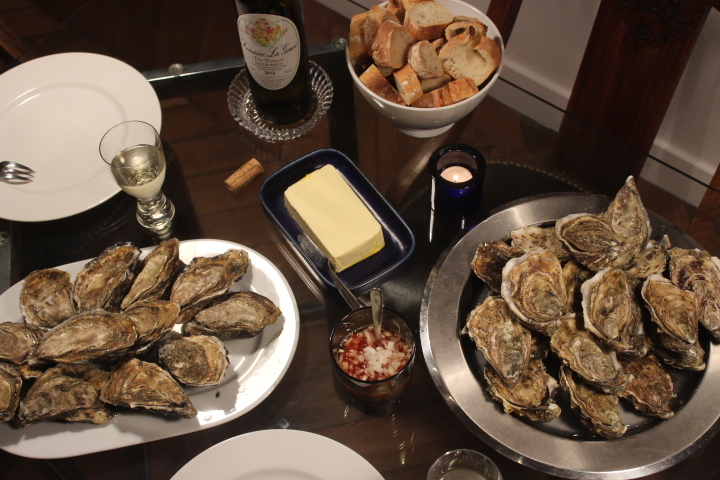 Fifteen oysters with vin primeur, and my Saturday night is perfect! Oysters: cultivated by Patrick Liron in Normandy. They can be found in three different arrondissements in Paris: 3, 7 and 15. Our favorite oyster type is huître sauvage but I was told yesterday that they will only be available starting November. We purchased 30 oysters in total, three different types but all size two, for 37€. 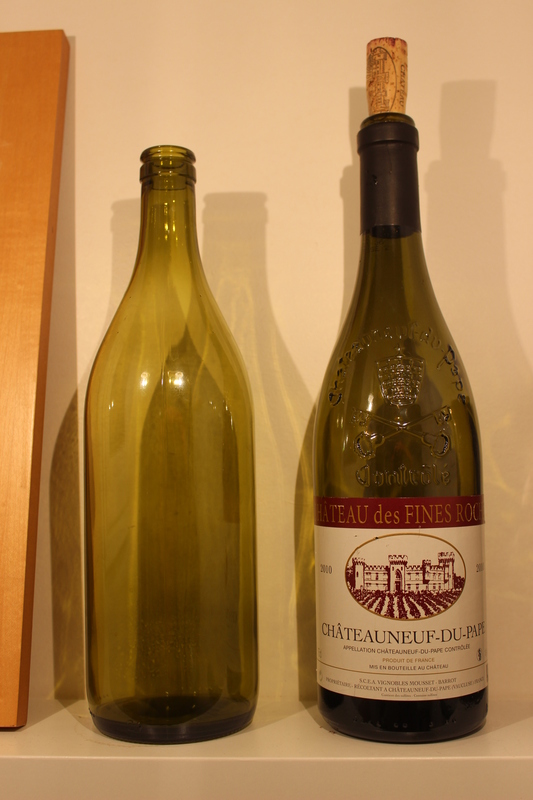 Wine: vin primeur by Domaine La Grave, Coteaux de Peyriac (Hauts de Badens). Vin primeur means new wine, and it is sold the year it was harvested. Sometimes only few weeks later. It is at its best within few months of the release. The most famous vin primeur is obviously Beaujolais nouveau. The white wine we had yesterday comes from our favorite caviste, Bernard Bouichet who has an outstanding taste in good-quality, healthy-tasting wine. We bought one bottle of vin primeur last weekend and returned yesterday to buy ten more. At 4€80 per bottle, the price-quality ratio is excellent. Where to find this excellent vin primeur? La Cave du Voyageur, 21 rue de la Croix Nivert (75015). Tel. 01-42 73 07 81. PS Have you already checked out the Pearlspotting’s facebook page? This entry was posted in Uncategorized and tagged food, Normandy, organic wine, oysters, Paris, wine on October 27, 2013 by Miia. France is a very diversified country. Each region has its distinctive history and culture that translate into specific types of cuisine. Tripe and cider in Normandy, crêpes and galettes in Brittany, bouillabaisse and ratatouille in the Mediterranean, socca in Nice, snails in Burgundy, duck and foie gras in the south-west, choucroute in Alsace, etc. The list is next to endless. Every time I travel inside the Hexagone, I discover something new food wise. And it is almost as fascinating to live in Paris, and visit restaurants, grocery stores or food fairs to discover products of those regions that I have visited. It is like bringing a tiny bit of vacation home… Earlier this year we visited the Salon des vignerons indépendants and saw a stand that looked familiar. 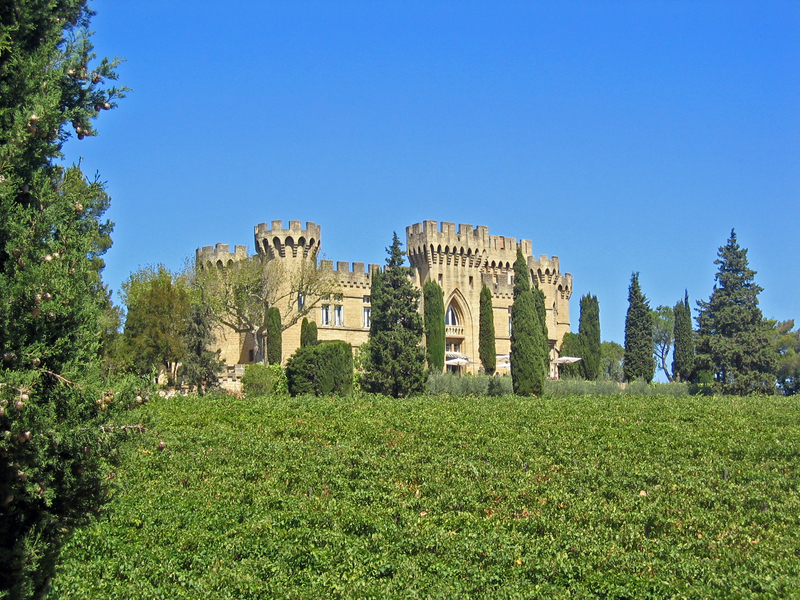 It said AOC Châteauneuf-du-pape and the bottles had Château des Fines Roches written on them. 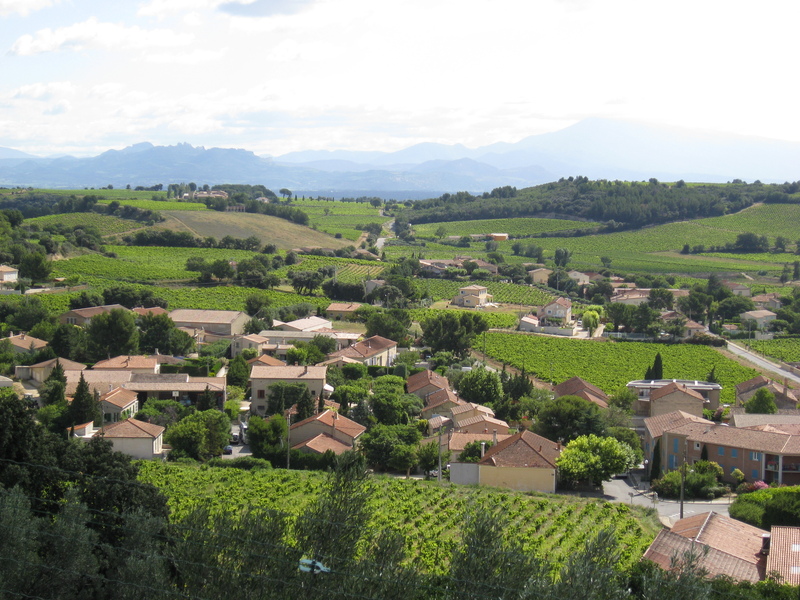 We knew immediately where they are located: 15km from Avignon, in the southern Rhône Valley. Fines Roches refers to the château around which the grapes to make this wine grow, but it is also a place where we had a fabulous lunch in August 2006! We started talking with the owners and ended up buying some bottles of their red. And last week we opened one of these bottles, a bottle of AOC Châteauneuf-du-pape Château des Fines Roches (2010) to celebrate our wedding anniversary. And this week the winemakers, the Mousset-Barrot family, sent us an invitation to the Salon des vignerons indépendants that will take place in Paris during the last weekend of November. Très sympa! This entry was posted in Uncategorized and tagged food, France, hotel, Paris, restaurant, wine on October 26, 2013 by Miia. After my meeting in the 16th arrondissement this afternoon, I started walking toward Grand Palais, which equals FIAC this week. However, on my way, there was Musée d’Art Moderne de la Ville de Paris, one of my favorite museums in Paris. So, I walked in. 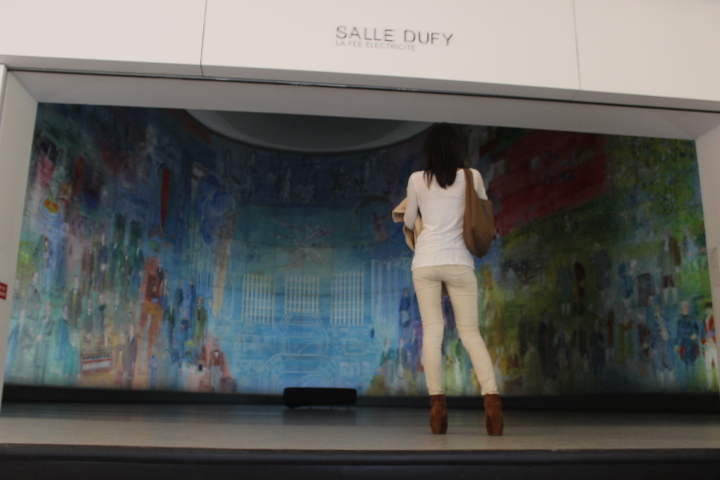 It has been several months that I have not have my Delaunay, Dufy and Modigliani dose! The permanent collection of this museum is free, and the building is full of light. I describe this museum “cheerful”. It rarely is a top priority for a tourist visiting Paris, but in my opinion it makes an excellent introduction to the turn-of-the-century artists. I find Dufy’s La Fée Electricité (The Electricity Fairy) fascinating. After an hour or so, I walked out. But there was another “obstacle” between me and FIAC. 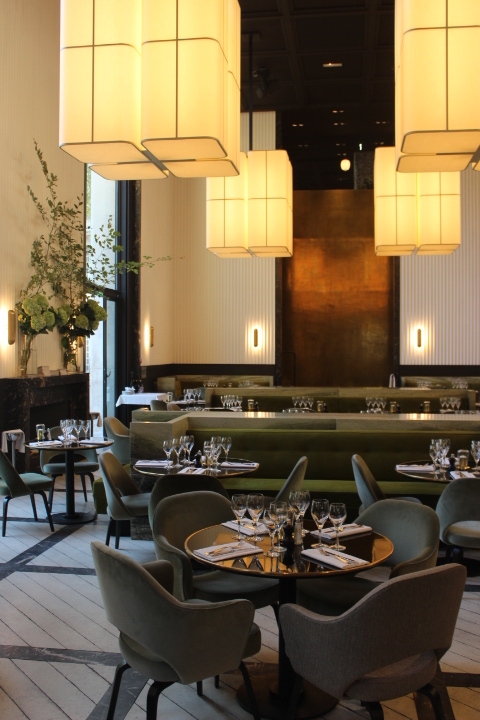 Palais Tokyo was a few steps away, so I decided to check out its new restaurant Monsieur Bleu. I loved the interior design and thought that the green, which dominated the restaurant, was a particularly beautiful shade of green. There was also a dark grey fireplace made of marble, almost identical to the one we have at home. The lamps were massive but discreet. Indeed, I give full ten points to Monsieur Bleu’s looks! By the time I closed the heavy metal door of Monsieur Bleu, my feet stopped cooperating. No FIAC today, they told me. Mea culpa –a new try tomorrow or Saturday! PS why not to follow Pearlspotting on Facebook, too? This entry was posted in Uncategorized and tagged architecture, art, design & decoration, fashion, food, France, museum, Paris, restaurant, wine on October 24, 2013 by Miia. Which one do you prefer? Spring or autumn colors? This entry was posted in Uncategorized and tagged architecture, Paris on October 22, 2013 by Miia. One of my favorite art events in Paris starts this Thursday! FIAC is an annual art fair where galleries from all over the world present their collections. It is a fascinating meeting point, and a melting pot, of contemporary art. I have attended FIAC several times and have always found it very enriching. This year the main event takes place at Grand Palais, which is one damn piece of art (and architecture)! 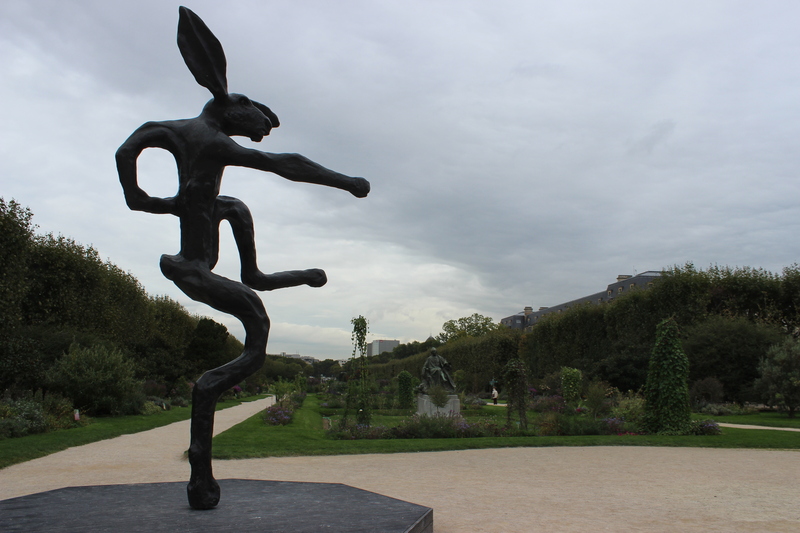 Other outdoor art installations can be found at Jardin des Tuileries, Jardin des Plantes and Place Vendôme. Grand Palais: From Thursday October 24 to Sunday October 27 from midday to 20h. Nocturne on Friday October 25 until 21h. 35€ for adults, free for children under 12 years old. 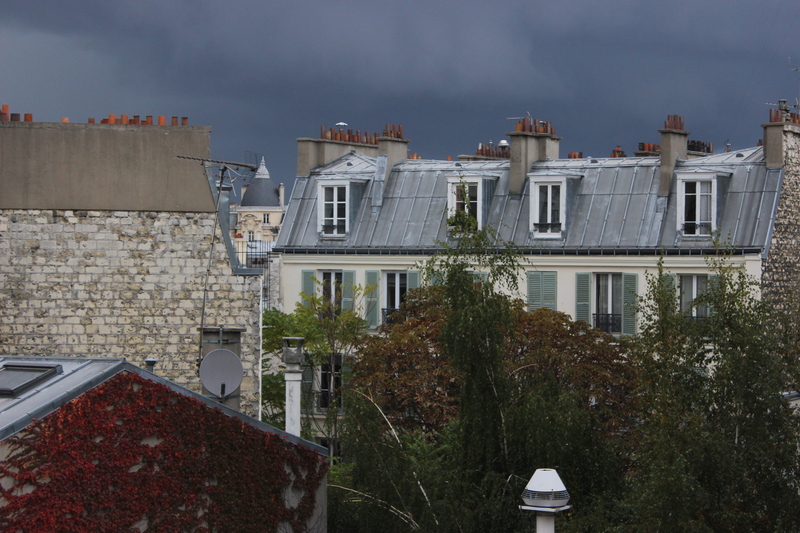 This entry was posted in Uncategorized and tagged architecture, art, France, Paris on October 21, 2013 by Miia. Observing seasonal variations of food markets is definitely one of my main Sunday hobbies. We are now officially in autumn, which means endless amounts of cabbage, figs, pumpkins, pomegranates, persimmons, mushrooms, etc. No more strawberries, melons and peaches. Today was a particularly interesting day at the Bastille market, and this is what we got for less than 10€! There was a whole rabbit (with fur and all that!) 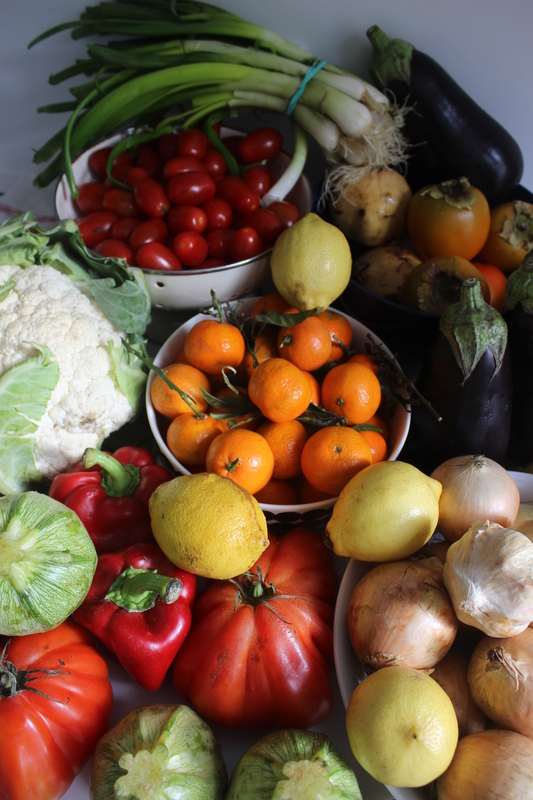 for 9€ and the vendor would have prepared it for us, but we skipped it this time… This week we will be eating healthy: cauliflower soup, onion soup, ratatouille, grilled eggplants and stuffed tomatoes. Unless you would like to suggest something different? This entry was posted in Uncategorized and tagged food, market, Paris on October 20, 2013 by Miia.